If you are a resident of Houston, Texas (I am) you should definitely be proud today. The city’s first Poet Laureate was chosen on April 9, 2013! Gwendolyn Zepeda, writer and poet was chosen to represent the 4th largest city in the United States. Check out the information below about her journey. I love Zepeda’s work and she will represent our city well! Mayor Annise D. Parker and Houston Public Library (HPL) Director Dr. Rhea Brown Lawson today announced that award-winning author and poet Gwendolyn Zepeda has been selected as Houston’s first Poet Laureate. Zepeda will represent the city by creating excitement about poetry through outreach, programs, teaching and written work. She will receive an annual honorarium of $5,000 through the City’s Initiative Grant Program of the Houston Arts Alliance and serve a term of two years, April 2013 through April 2015. 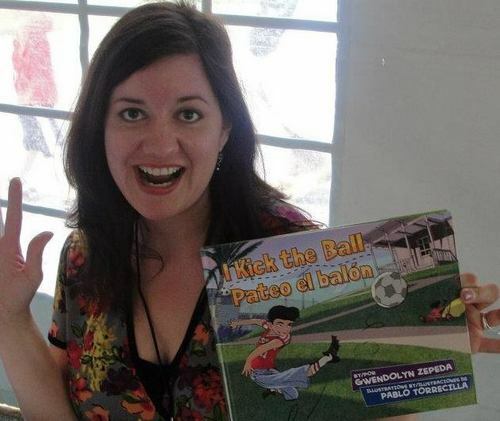 Zepeda is a Houston-based author that is best-known for her works of fiction, including Growing Up Tamales, Houston, We Have a Problema, Lone Star Legend and Better with You Here. However, Zepeda is also an accomplished poet. She has several chapbooks and published poems to her name, with a book of poetry due out in 2014: It’s Zepeda Not Zapata. As Poet Laureate, Zepeda is committed to developing a Community Outreach project for Houston’s many diverse neighborhoods, as well as to local businesses. She will conduct workshops in which she will share the art and love of poetry and participate in community based poetry programs. Zepeda will also provide content to the Houston Poet Laureate Program web page and publish poetry to the Website by the community members attending her workshops. The Houston Poet Laureate Selection Committee assisted in the nomination and selection process: Robin Reagler, Executive Director of Writers in the Schools (WITS), Janet Lowery, Professor and Cullen Chair of English and Creative Writing in the University of St. Thomas Department of English, Rich Levy, Executive Director of Inprint, Fran Sanders, Founder of Public Poetry, Joseph Campana, Assistant Professor in the Rice University Department of English, Chitra Divakaruni, Professor in the University of Houston Department of English, Shannon Buggs, Director of Communication in the University of Houston College of Liberal Arts & Social Sciences, Diem Jones, Director of Grants at the Houston Arts Alliance, Elizabeth Brown Guillory, Distinguished Professor of Theatre and Associate Provost/Associate Vice President for Academic and Faculty Affairs at Texas Southern University. Jennifer Schwartz, Program Manager of the Houston Public Library, and Minnette Boesel, Mayor’s Assistant for Cultural Affairs of the City of Houston, are the non-voting members of the Committee. The HPLP is a partnership between the City of Houston, HPL, Mayor’s Office of Cultural Affairs, and Houston Arts Alliance (HAA).